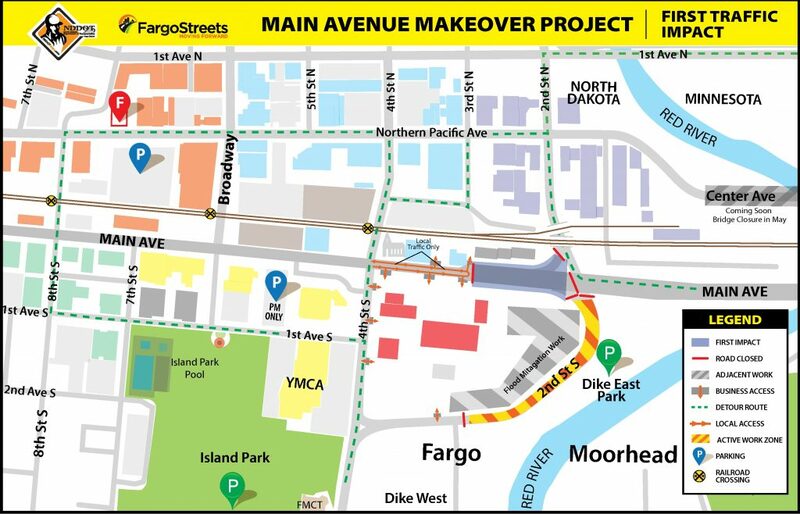 Starting, Wednesday, April 17, crews will close the first section of Main Avenue roadway to through traffic between 2nd Street South and 4th Street South. Crews will begin the first blocks of storm sewer installation. Main Avenue between 2nd St S and 4th St S will fully close to through traffic. Local resident access will be maintained by temporary access roads across Main Avenue through the Gateway Center parking lot. In this stretch, Main Avenue is slated to reopen to local traffic by late-July. Construction of the 2nd St S roundabout will not allow through traffic to use Main Avenue until work is complete at the intersection in October. Main Avenue and 4th St S intersection will fully close to all directions of traffic. Slated to reopen to traffic late-June. 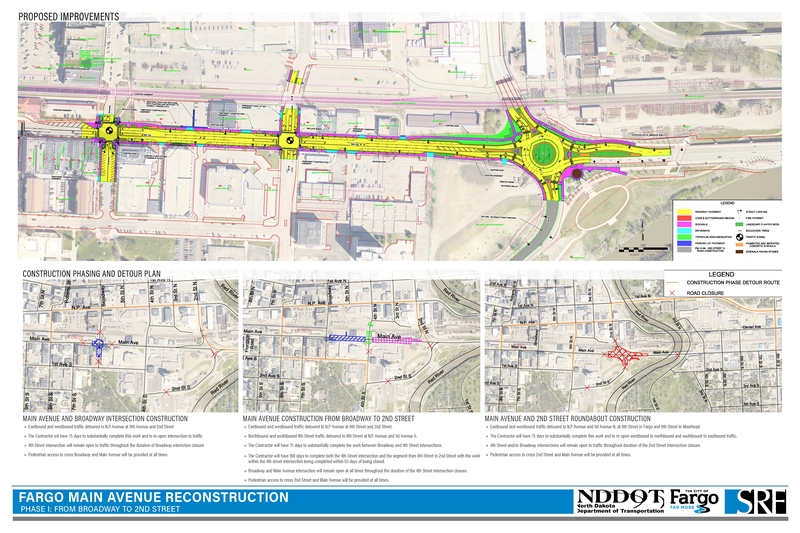 Project teams are coordinating efforts with the City of Moorhead’s Center Avenue reconstruction work, which will turn Center to two-lanes in each direction from 8th Street North to Red River and work is slated to begin in early May. 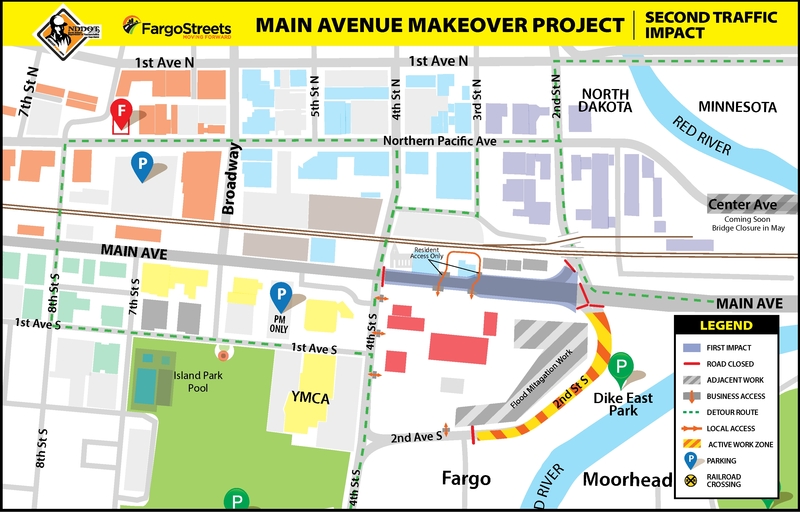 During the Center Avenue bridge closure, Main Avenue traffic will be diverted to the 1st Avenue North Red River crossing. Pedestrian access to all businesses along Main Avenue will be provided and sidewalk work will not begin until after the roadway is complete. Temporary on-road delineated paths will be used by pedestrians during the sidewalk work. Monday, April 15 at 4 – 6 p.m. – A public information meeting will be held at Depot (701 Main Avenue, Fargo) to share the slated project schedule. Formal presentations will be held at 4:30 and 5:30 p.m.
Thursdays, 11:30 a.m. – Noon – Ongoing public information meetings will be held bi-weekly. The first meeting date is Thursday April 25 at the Depot.